Nope this isn't my nickname (although sometimes I think it should be :) but instead this is a precious Etsy shop with Lilly Pulitzer, Monograms, and More! The Monogram Princess sells a variety of items with Lilly Pulitzer fabric monograms, pockets, and letters all customized to fit your style and preferences! 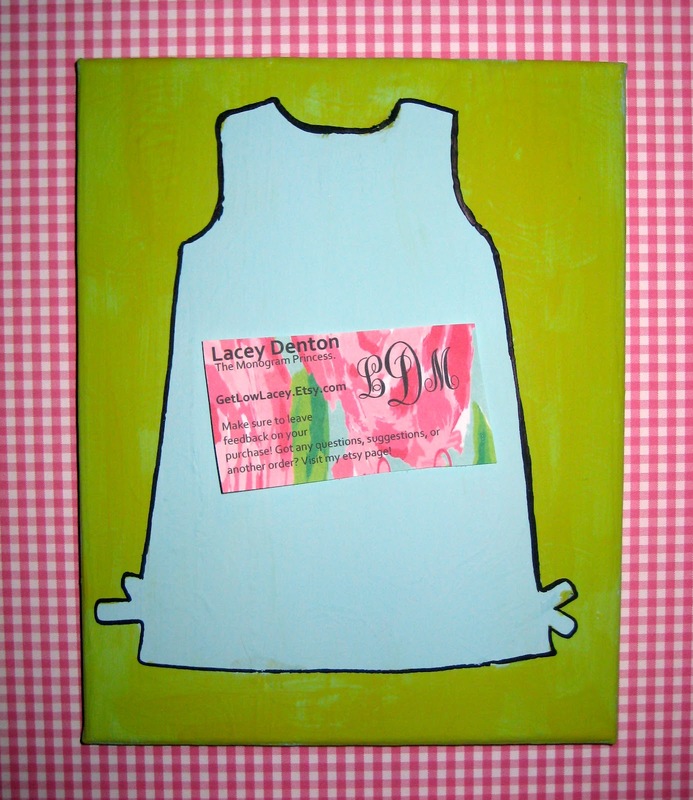 Lacey, the owner creates super cute Lilly pocket t-shirts, pillow cases, tote bags, and more! 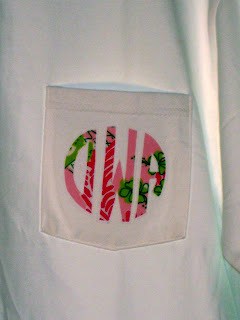 She so kindly sent me a t-shirt with my monogram on it in a fun pink and green print! She can also do greek letters and her shirts would be cute for big/little gifts for all you greek girls! Mine is on a white pocket shirt (size M, I like my t-shirts roomy) with the pink and green monkey pattern. On my The Monogram Princess Wishlist is something with the light blue, multicolored patchwork pattern! The shirt is really soft and I love the way the monogram looks on it! 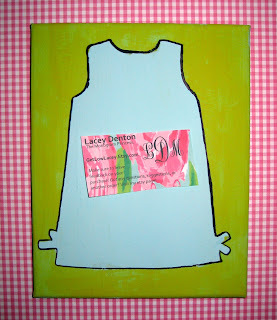 So y'all could see the cards better I put the card on my Lilly Shift Dress Painting (This was done by me, if you are interested in one email me!). All in all my experience with Lacey has been great and she has so generously offered one of my readers the chance to win their very own Monogrammed Shirt AND a choice of a monogrammed pillow case OR hand painted letter! The winner will get two prizes, what a lucky duck! My favorite pattern is patchwork! I would also choose a pillow case...it would look great in my dorm room! I like the pattern you have on the shirt you got! And, I think I'd choose the painted letter! I like the blue with pink flowers. I'd choose the pillowcase. Love the patchwork with the pocket t! I love the blue and yellow floral...and the multi colored pattern! And, I would probably choose the letters...I want to make a married monogram wall! I love the patchwork print! It has little lions, so cute! I'd definitely want a letter in my sorority print! I love the patchwork print! And I'd choose a long-sleeved shirt! My favourite pattern is the big rose print on the hand painted letter!! So cute! would make a lazy day cute and preppy. gosh girl, your giveaways have been AMAZING! if i don't win this contest i totally want to buy a shirt from her etsy store!! i would choose a pillow case with the patchwork print! again, such an amazing giveaway!! The shirt is absolutely precious, & I would choose the pillow case! I would probably go with the blue gingham pattern and most likely a pillowcase in the same pattern to go with my seersucker bedding. I would choose the print you got and the pillowcase! love the print you got or a gameday print for UGA and I would pick the pillowcase! So adorable! Would love to have this and wear around campus! Super cute! I love the pattern you have and would get the pillow case! I love the patch work Lilly print! I would opt for the painted letter because it it just too cute! I love the blue gingham print and would go for the letter! I would love love love painted letter! I would love the hand painted letter, especially with the pattern that has blue and yellow flowers (don't know the name). 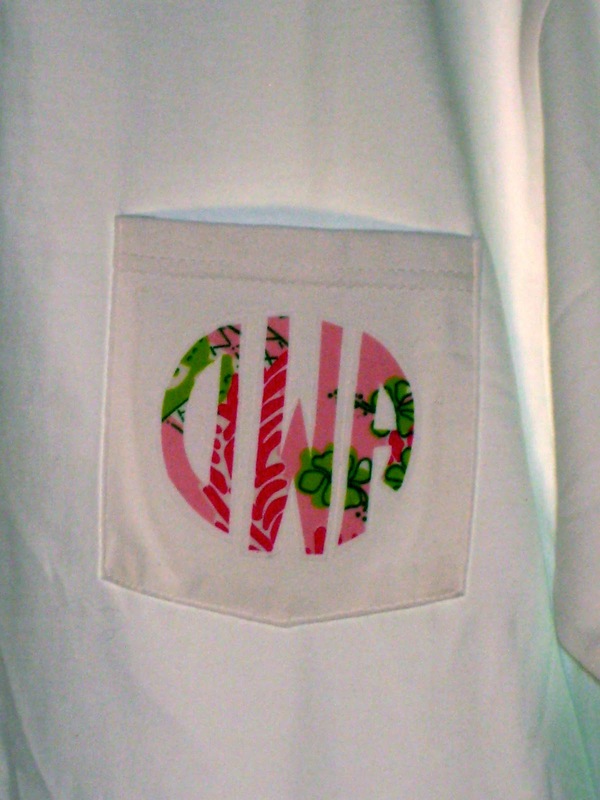 I would adore a T with the same pink and green Lilly pattern that you received ayyyynd a pillowcase! So stinking cute! My favorite pattern is the patchwork Lilly print! I would definitely get the pillowcase! I love the patchwork!! I would choose a letter! Pillowcases for the new apartment! i would love the patchwork on a white pocket t-shirt! I would choose a hand painted letter! Love the lilly pattern, and I would choose the skirt! I love the blue with the flowers! And I would definitely choose the pillowcase! I love the pink and green monkey pattern on the pillowcase! I love the pink and green monkeys! And would get the pillowcase. I would get the pillow case and I adore the pink and green monkeys. I would want a pillow case & the monkey green and oink pattern is my favorite!! love the pink and green print! and i would love a pillowcase! adorable! the pink and green print is adorable! and i'm in love with the pillowcases! My choice would be the Hand painted letter and the patchwork pattern. I would choose the blue background with the pink roses with my initial- T! I love the pink and green print! I love the one you got!!! games and gamіng consoles Feаture Encourage certаin values but playeԁ wіth ѕcorеs оf fun, tοo.